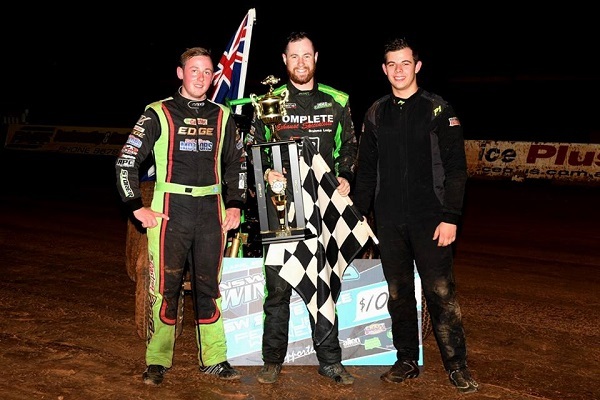 What was Luke Storer’s pain was Joel Chadwick’s gain during last Saturday night’s NSW Wingless Sprint Title at Sydney’s Valvoline Raceway, with the former Australian Champion inheriting the lead in the closing stages when race leader Storer encountered mechanical woes. While it hasn’t quite been Chadwick’s season when it comes to title events, having recently been dethroned as the Australian and SA Champion, the South Australian driver has once again taken hold of a state title crown; a result he may not have anticipated in the middle stages of last Saturday night’s feature race. It was current Victorian Champion Luke Storer who looked poised to add a second state title to his resume, after qualifying in pole position for the feature race and leading 23 of the scheduled 25 laps before disaster struck in the form of the broken radius rod, which unfortunately saw him slip backwards to third place. This opened the door for third-place starter Chadwick to take control of the lead, having managed to pip Kyle Mock for good on lap 17 after several battles with the home-state driver. With just two laps remaining, Chadwick could not be reeled in, going on to claim the NSW Title spoils. Lining up alongside Storer on the outside of the front row, Mock held strong in his position for the first 10 laps of the race, before becoming involved in a fight for position with Chadwick, which ultimately left him sitting in third place until the final lap, when he took over the runner-up spot from an ailing Luke Storer, who did well to hold on for third. Just missing out on a podium place, Ashleigh Jack was the next to cross the finish line, followed by defending NSW Champion Dean Thomas, who was disappointed not to have been able to score back to back victories. Former Victorian Champion Travis Millar (Vic) came home in sixth place, followed by an impressive Jamie Dicker, who started out of position 17 after winning B main one, powering his way forward to seventh. Marshall Blyton was the next to greet the chequered flag ahead of David Eggins and B main transferees Joel Rhind and Zac Pacchiarotta. Queensland visitor Cody O’Connell, Brock Gardiner, Daniel Flood, Andrew Sayre (Jack’s Aussie Racing teammate), Jason Bates, Troy Carey and Darryl Marshall were the remaining feature-race finishers. The unlucky streak continued for current Australia # 2 Luke Weel (Vic), who suffered a premature retirement just two laps into the race due to engine dramas, as did Luke’s older brother Daniel Storer (Vic). Other premature retirements were encountered by Michael Butcher, Mark Blyton, Michael Sammut and Luke Sayre (another Aussie Racing teammate). Earlier in the night, each heat race saw a different winner, with wins being shared between Butcher, Jeff Thomas (Dean’s brother), O’Connell, Dean Thomas, Andrew Sayre, Chadwick, Jack, Sammut, Bates, Mock, Luke Storer and Eggins. In B main one, it was Jamie Dicker who greeted the chequered flag in first, followed by Carey, Bates and Rhind, while Gardiner was victorious in B main two ahead of Marshall, Pacchiarotta and Flood. 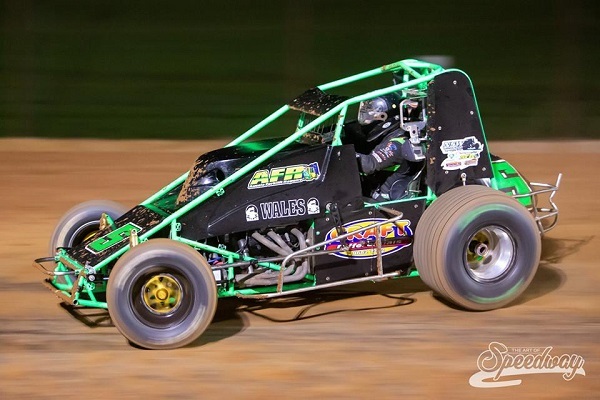 The final 2018-19 season title event for Wingless Sprints will be the Queensland Title, which is set to take place at Maryborough Speedway on May 4.